Now, you may be trying to stay as far from the stove as possible. Your cooking horizons may have shrunk to slicing things up for sandwiches, maybe stretching to cutting up fruit if eating it whole is impossible. You may even be fanning yourself with a sheaf of shockingly high electricity bills right now, a glass of iced something or other by your side. And here I am wanting you to get out your biggest pot and deliberately stand over a fruity sauna to make jam. Yes, it’s that time of year. Time to get jamming. It does seem a particularly cruel quirk of Nature to have nearly every good thing available to us in the one season, the season when we want to be lazy, hazy and good for nothing. Because for many jam, jelly, chutney, cordial and sauce makers it’s practically a full time job, not only gathering all the produce but preparing and potting it up. But isn’t it about the most worthwhile task of the growing year? Seeing a row or two of gleaming bottles, labeled and proud on their shelf, is a fitting reward for all of that – not to put too fine a point on it – sweaty chopping, stirring and bottling. And of course the best part is dipping into your homemade jam or sauce come November time, when the frenzy of summer growth, with its heady smells, tastes and colours, is a fuzzy edged memory. 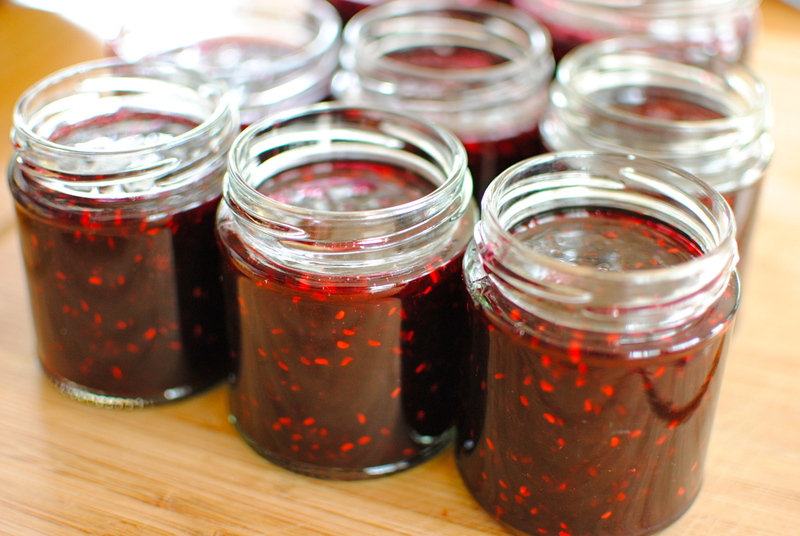 Today’s very simple jam recipe is my favourite. 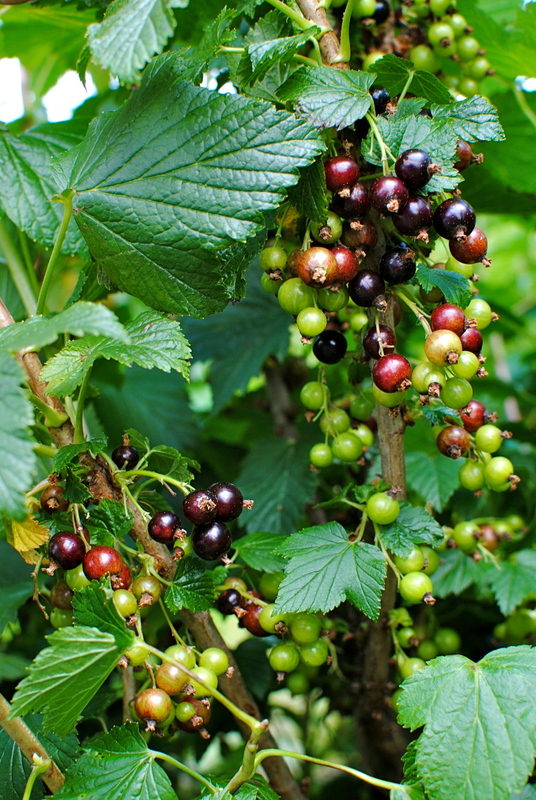 I didn’t know about blackcurrants until I moved to the UK and, I must say, as a fruit on its own it’s not my favourite (a fantastic British way of saying I don’t like it). But in a jam, oh wowee, it is unsurpassable. I will happily shlep out to the pick-your-own fields, stooping as God did not intend us to do, all to get a gluttonously filled basket of these dainty but flavoursome berries. Or, let the supermarket do the choosing for me. As much as I love straight up blackcurrant jam, I like it all the more made with the rather more common raspberry. For me, these two together are more than the sum of their parts. 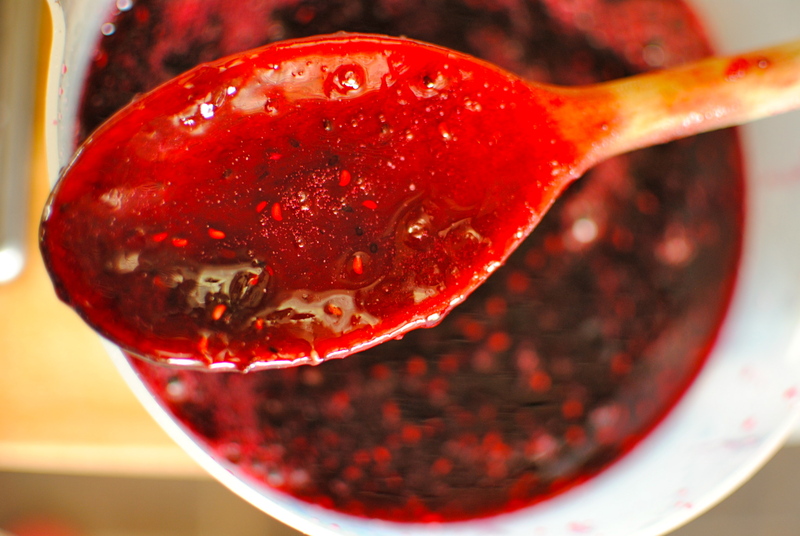 Even writing about this jam makes me want to get a spoon and eat some straight from the jar. But I will hold back. I’ve been told off too many times by Mr A about eating at the keyboard, and as I am very messy I am sure to leave a tell tale amethyst-coloured blob where a letter might be. 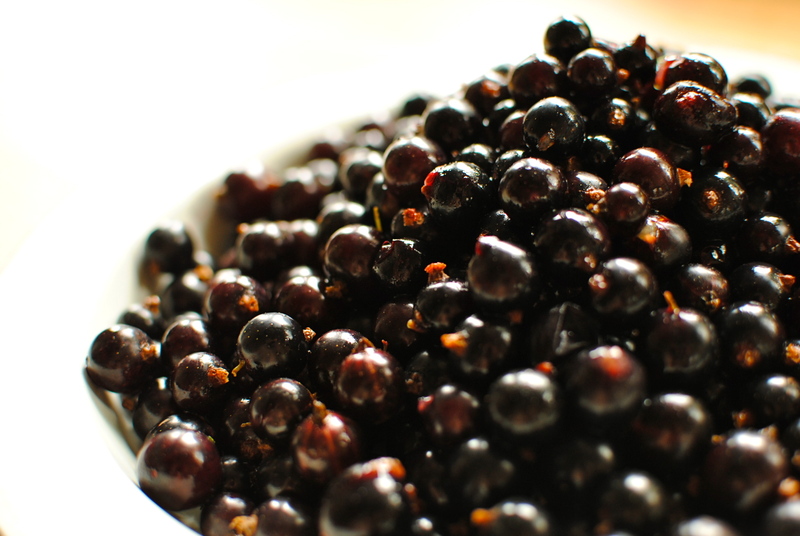 For those of you in more southerly latitudes currant season may have already passed. If so you should be on to blackberries, in which case feel free to substitute the currants for them, but I would add the juice and ‘shell’ of half a lemon (fish it out later) and use preserving sugar too. This accounts for the much lower pectin and acid content (which also affects set). It won’t have the sharpness of the currants but blackberries are always worth preserving and do make delicious jam and jelly in their own right, of course. If you make blackcurrant and raspberry jam, do hold back a jar for next post’s recipe. I will be bringing you the simplest, tastiest little two-bite tarts you can imagine. Gluten-free too. Until next time, get picking! Or shopping! Are you doing any end-of-summer preserving? What things are abundant around you that you plan to ‘put up’ for eating later? Do you have any links to your own or another favourite preserve recipe? If they aren’t a family secret, please send them in to share with us! 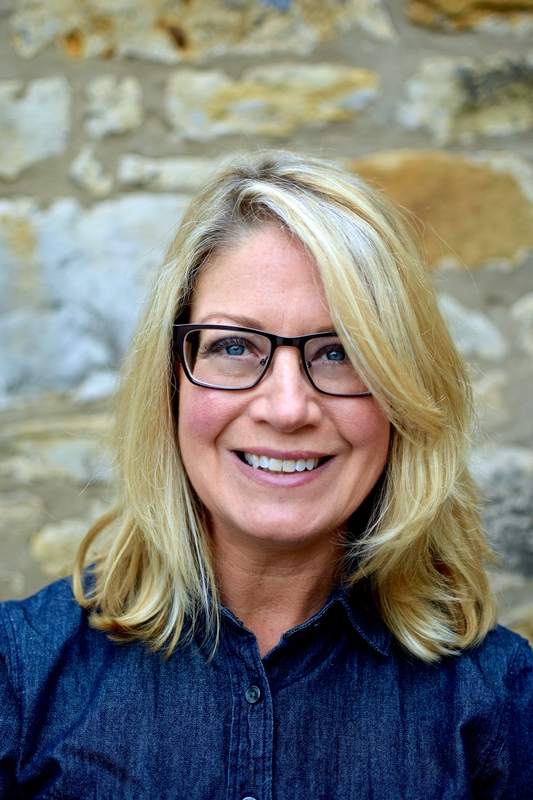 Miss R’s Track of the Week: could it be anything else but Bob Marley’s ‘Jammin’? Although jam-making could never be said to be a quick task, it is a pleasurable one. And making this jam could not be simpler. If you have time to destalk the blackcurrants and for a bit of stirring, seven (maybe 8) pots of bishopric purple jam can be yours. To have and to spread. From this day forth. Amen. 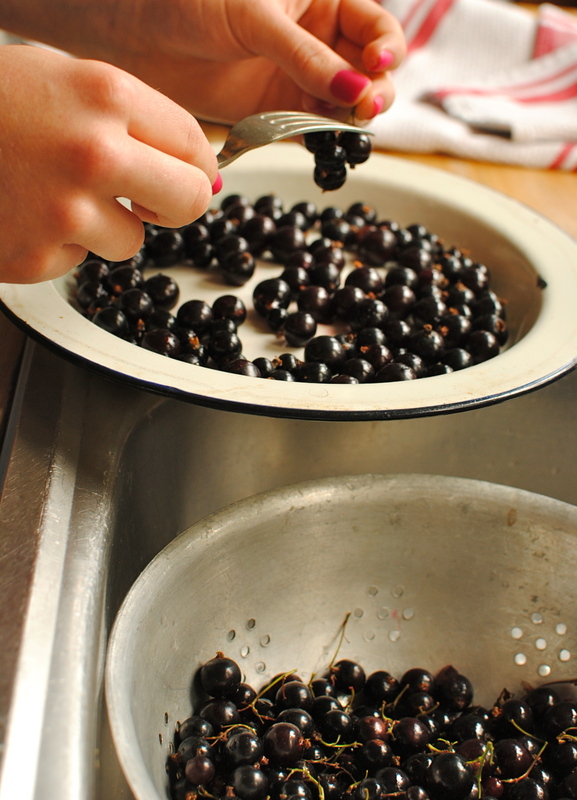 Using a fork pick over the blackcurrants, removing the stalks and any imperfect fruits. The little dried end is the flowering end and needn’t be removed. If some burst as you are destalking, that’s fine, but don’t include ones that are already burst. You can do all this with your fingers but I find that the fork method is easier and less messy. I tend to do this outside where the hens can hoover up any stray bits of fruit. Can’t vouch for dogs though. Blackcurrants get tough if you boil them straight away in sugar so pop the blackcurrants and the less fussy raspberries into the pan and cover with 500ml of water and the lemon juice. Slowly bring to simmering point (don’t rush this), and let it gently bubble for 15 minutes. Add the sugar and stir continuously until dissolved. Quickly bring the fruit to a full boil; boil hard for eight minutes. Remove from the heat and stir to help it cool a little. Test for set by either taking its temperature with a jam thermometer (105 C/220F), or by putting a dab onto a fridge-cold saucer and allowing to cool for a minute – if it wrinkles slightly when nudged with a finger, it’s set. Another method often favoured is the ‘flake test’, whereby you dip a wooden spoon into the jam, lift it out horizontally over the pan, keeping it in this position to cool a bit. Then twirl it around a few times to let the jam fall off. If small drops run together to form a flake on the edge of the spoon, the jam has boiled long enough. I tend to do the flake test myself. Let the jam cool slightly before carefully pouring into the warm, sterilised jars, screwing the lids on while still quite hot – I do this holding the jar with a dry cloth. You may find it safer and easier to pour the hot jam into a large heat-safe plastic jug before filling the jars. The jam will set and become ‘proper jam’ after cooling completely. Caution: never put hot jam into cool jars – cracked jars and ruined jam. Ways with jam: toast and sandwich (doh), rice pudding, on blinis, to sweeten plain yogurt or kefir, on pancakes and waffles, as a cake filling, in tarts and flapjacks, on pavlovas and spread on – best of all – scones. Next time I will give you my simplest no-dough tart recipe using this gloriously purple-red jam. Your imagery as usual is stunning, especially the one of your beautiful taster – move over Nigella on the seductive eye front! That sounds gorgeous! When can I come over? I am a fan of the old borage flower ice cube thing but I have never tried red currants, and I know they are bang in season right now (making some plain jelly with them for later in the year with lamb and stews etc). Thanks for the tip. And thanks for the jam big up. There is a jar waiting for you, as well as something more earthy from Lucca. See you soon, love. And – guessing here – the bubbles of the tonic, combined with the air in the berries (cos they float in water, don’t they) probs make it rise and rise. Dunno though. ps trust you to come up with a plausable science nerdy explanation for the dynamic berries- I bet you are right. Is Miss R yours? She’s stunning! Jammin is on my list of “things I should know how to do.” If one was fussy and spolied and needed the raspberry seeds removed, when would one strain them out? After it’s boiled? Stunning, indeed. Makes a Granddad proud. I take it you are referring to Miss R and not the jam! Lovely candid photo of her, but she will be cross when she sees where it is…I do like living on the edge, don’t I? Beautiful pics! I was somehow too lazy and busy (not sure how that works but it happened) to really preserve this year even though I said I would. Oh well, I guess that means fun fermentation projects this fall instead. I am still very much looking forward to the tart post!! 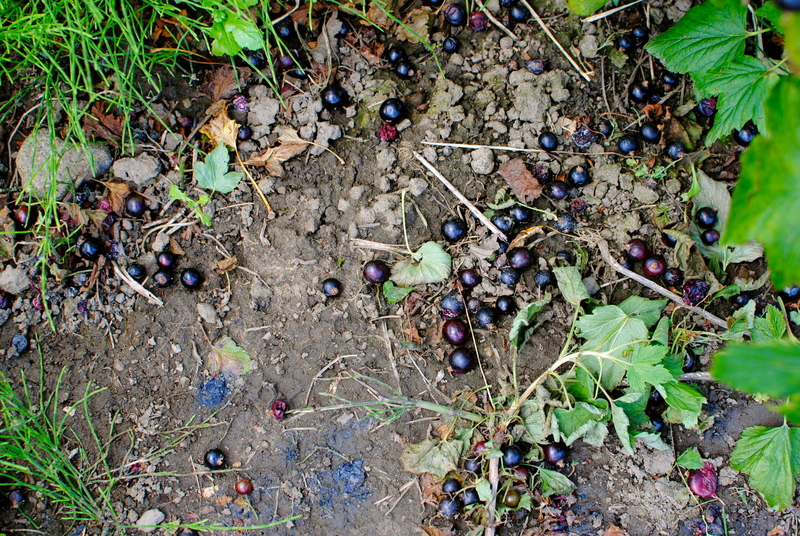 I have not seen black currants locally, but perhaps I just passed them by? What a marvelous jam! I am smitten with homemade jam. It just tastes better, real fruit flavor! I have made strawberry, blueberry, fig, apricot and my favorite Olallieberry jam this summer. Plans for salsa and pounds and pounds of tomatoes as soon as the glut arrives! Sadly blackcurrants have passed here in Cornwall, but we did get a jar of blackcurrant jam from my mother and I did get to make some blackcurrant ice-cream which is worth trying because you just might like that too. I’ve never tried raspberry and blackcurrant together in a jam, but I can see how well it would work. Your pictures are superb. I’ll get your number from my Dad. Okay? Or email me it and we can sort out a time & day. Kellie, a beautiful post. It is sooooooooo cold here today, even in late Autumn that I can barely wait for Spring and Summer! Thank you for bringing some berry nice sunshine to my day. 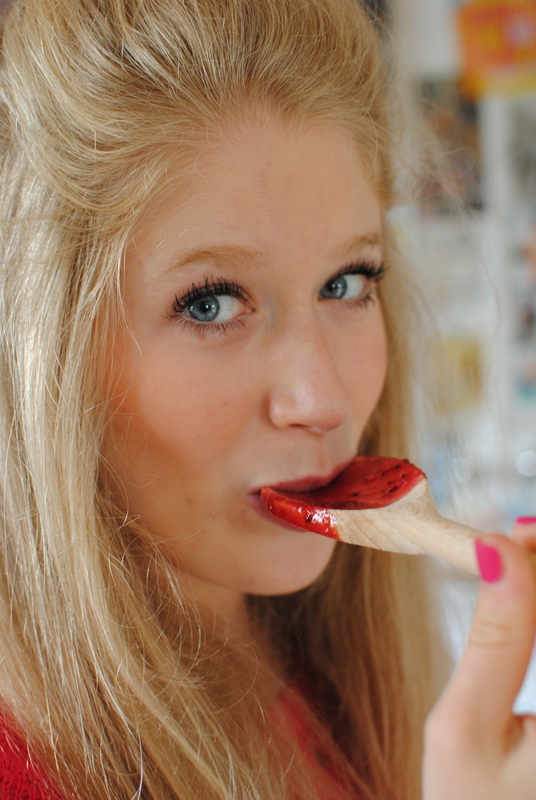 I can vouch for both the delicious jam and the gorgeous Miss R. The pics are stunning ! I haven’t made jams in years (I tend to go for fruit chutneys or pickles when I preserve), but this is certainly giving me the urge to get jamming – especially now that I know the “fleck test” (guessing was my method of choice in the past). The blackcurrant and raspberry mix looks and sounds amazing; just looking at those pictures I can taste it (a nice low cal approach to enjoying jam). Drooool worthy images! Sounds like a nice combo too. I’ve always wanted to try making my own jam. 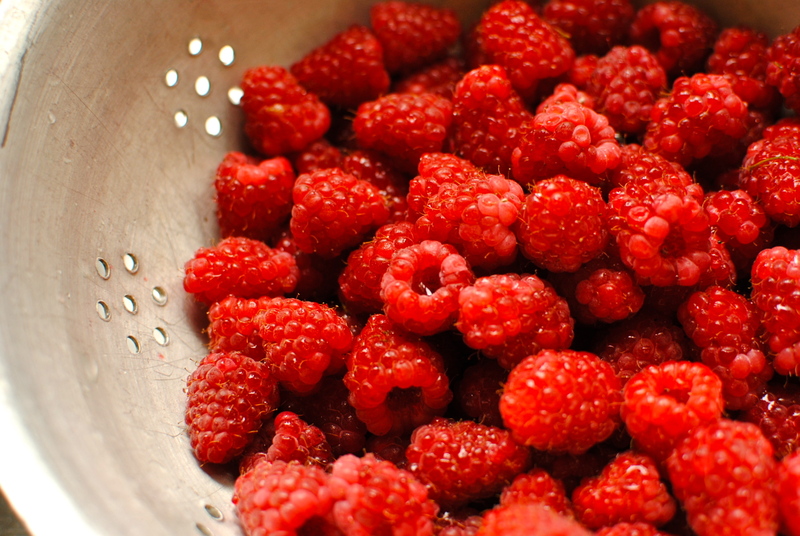 Raspberry is my favorite because it’s not too sweet – the little sour kick keeps it honest :). Yum! Try using frozen fruit – it works very well. 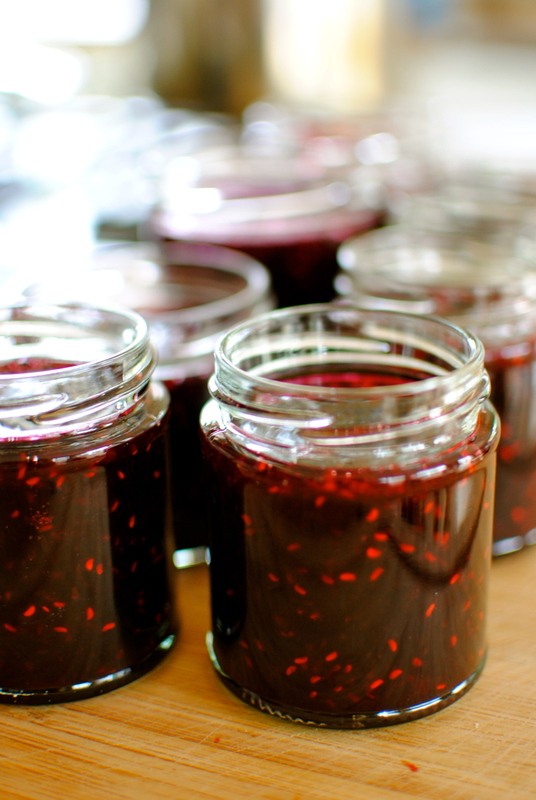 Making jam – the smell, the gleaming jars, the taste, the smug satisfaction – fab.